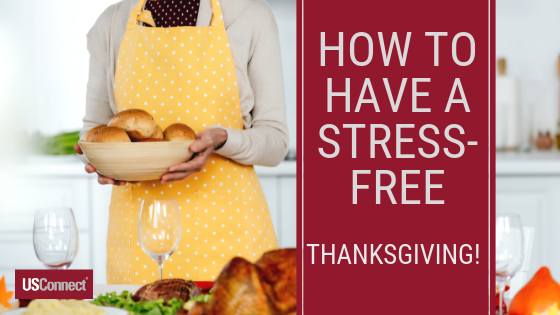 Enjoy a Stress-free Thanksgiving Feast This Year! In today’s job-focused culture, we find ourselves in our kitchens just before Thanksgiving with the stressful task of preparing a turkey and side dishes to have everything ready for the big “sit down” on Thanksgiving. Clean your house a week before the big day, so you do not have the added stress of last-minute housecleaning as well as meal preparation. Plan your menu at least a week in advance of the big day and make a list of everything needed to prepare each dish. Shop to have all ingredients on hand. That way, you won’t stress in the middle of meal preparation when you realize you don’t have a crucial ingredient. Make some things a day or two early and refrigerate or freeze. Thaw your turkey (if frozen) in the refrigerator for about 24 hours for each 4-5 pounds. Set your table(s) the day before: it’s a big stress-buster to know that this task is done. Simplify your meal. Cut down on the number of side dishes. Just a few well-chosen, loved recipes will be just as satisfying and help to discourage guests from over-stuffing themselves. Ask for help. You could request that one or two family members come early to help with the preparation or bring a side dish. Just remember, your family really doesn’t care if everything is made from scratch and perfect. They want you to be able to relax and enjoy time spent with them. Make that a priority and forget about some unrealistic goal.